Mountain Hiking Holidays Blog: Gear Up! Looking for gear for your next mountain hiking trip? Here are some of our favorites. After two decades of leading mountain hiking trips on four continents, these are the items we turn to again and again. In 2017, John traveled for 22 of the 52 weeks of the year, and logged 110 hiking days involving over 1,100 miles and 220,000 feet of elevation gain and loss for the year! Boots: We hike in leather Asolo boots. These boots provide great ankle support (they come above the ankle), traction with Vibram soles, and protection with a sturdy leather body that protects from rocks and uneven terrain. We have logged many miles on rough mountain trails with these boots. The TPS 520 GV EVO (Women's Chestnut) retails for about $315; there is a version for men, as well. Be sure to allow two to four months to break in these boots, and include at least 6 weeks of long day hikes in the mountains (five hours or more with 2,000 feet of elevation gain) to be sure these boots are really comfortable before setting off on a MHH trip. Alternatively, Merrell has an above the ankle waterproof boot that will break in much more quickly. The style is Merrell Moab 2, Mother of All Boots Mid. There is a version for men, as well. Go for a boot that supports your ankle and provides good traction. You can consider water-proof or resistant boots, but be aware that even these will lose that capability with time and use. Socks: Wearing wool socks provides cushion for your feet, and adds a layer of warmth in case your feet do get wet. We wear Smart Wool socks (Hike Medium Crew). 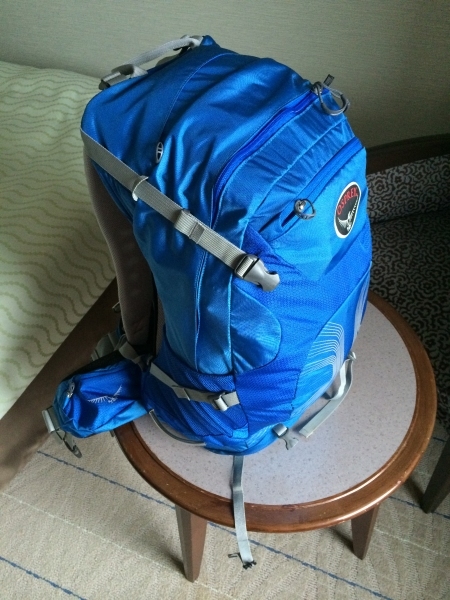 Osprey 34 liter Stratos packed for five days on the Kumano Kodo Pilgrimage. Pack: On the trail with Mountain Hiking Holidays you'll need to carry a day pack containing your rain jacket, rain pants, fleece coat, warm hat, warm gloves, water, lunch (and other personal items). A day pack with a 20 or 30 liter capacity is great. We both carry 34 or 36 liter Osprey packs (for extra safety gear). Hat: Keeping your head dry and your face protected from the sun is a priority. We like the Seattle Sombrero by Outdoor Research. We find this hat to works well for us under most conditions except on the hottest days in the Sahara desert! Please let us know what your favorite gear choices are, and we look forward to seeing you on the trail soon.